This week in sports American Pharaoh won the Preakness giving the three year old a shot at the Triple Crown, the New York Rangers beat the Tampa Bay Lightning in the first game of the NHL semi-finals, and Patriot fans are still debating “Deflategate.” But in our opinion, these headlines pale in comparison to the most exciting sporting news of all: the success of the Volvo Ocean Race stopover. All anyone can talk about in the sailing world—and in the state of Rhode Island at large—is the Volvo Ocean Race stopover in Newport. The Hinckley Company, Hunt Yacht’s parent company, was proud to be a Community Partner for the wildly well-attended event. 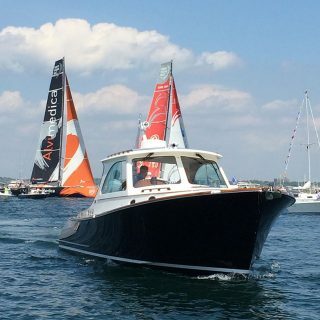 The Race Organizers estimate that there were around 125,000 spectators that filed into For Adams since the Race Village opened on May 5, making the stopover the most watched sailing event in US history. This number does not even account for the crowds who watched from Jamestown, Castle Hill, Brenton Point Park, and the roughly 500 boats in the spectator fleet. At Hinckley, we aren’t surprised by this. We’ve always thought of Newport as America’s unofficial sailing capital (sorry Annapolis) and after this epic turnout it’s safe to make it official. Newport is least populated stopover city this VOR cycle but it turned out the second largest crowd, after Alicante, Spain, the Race Headquarters and site of the Race’s start. Not only was the spectator fleet one of the largest in the 2014-2015 Volvo Ocean Race, it was one of the most beautiful, thanks to the multiple Hinckley and Hunt Yachts in attendance. We have some great photos from the in-port race and the start of Leg 7 of the Volvo Ocean Race. Check out our Facebook album to see if we have a picture of your boat! « No Prop? No Problem!